The architect, Stephen Jolsen, has turned this 1950s building into a strikingly modern family home. 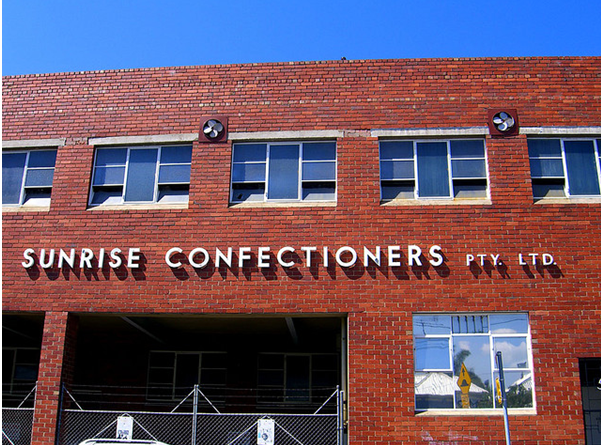 The former Chocolate factory, still bearing the Sunrise Confectioners sign, was in a dilapidated state when he purchased the property in 2006. Jolson recognised the fact that it is rare to find warehouses from this area interact and saw a certain “honesty” in the building. The factory had ceased production only a few years earlier. Its ground floor consisted of a concrete loading dock for trucks and fibro portioned offices. Two sets of stairs leading to the first floor revealed an open space with an old asbestos sawtooth roof and large steel-frame windows. All the old pipe work was still full of sugar. Following Jolson’s renovation the building now houses a high-tech family home and office. 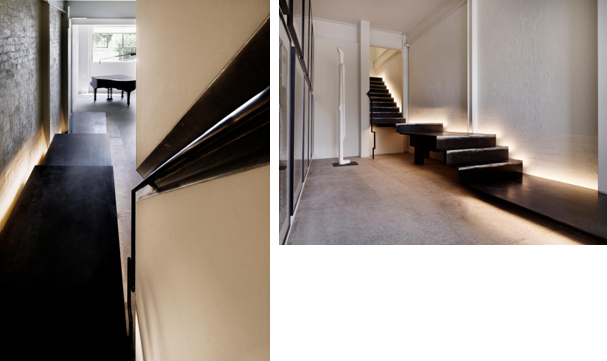 On the ground floor is Jolson’s firm, a boutique architectural practise that specialises in innovative commercial and residential design. The residential section is hidden behind a wall of his office. Jolson removed the sawtooth roof, leaving four perimeter walls on the concrete slab above the garages. They used steel to retain and support the old façade without crossbeam supports. Jolson then steeped back 10m from the façade and built a new two storey house on the first floor of the factory. 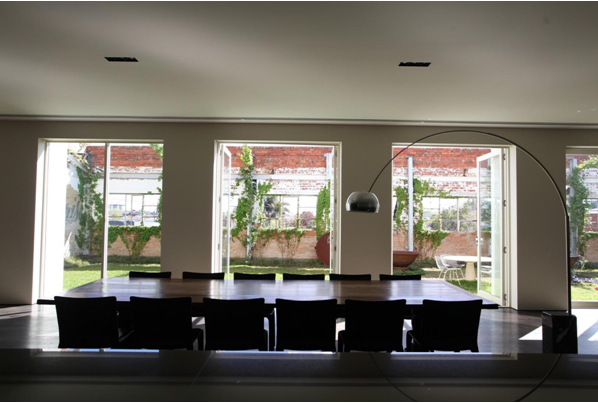 The house has been designed around the garden which is located directly off the living room. Having the garden on the first floor is said to anchor the residence to the ground and creates the level separation from the offices below. The original exterior brickwork has been retained and the old line of the sawtooth roof, but largely the property was gutted to create a modern open plan living area. By pulling back the second floor 10 metres from the brick facade, Jolson created a private, elevated, 22 by 10-metre, north-facing garden, with real grass and stunning views of Melbourne and the Dandenongs. 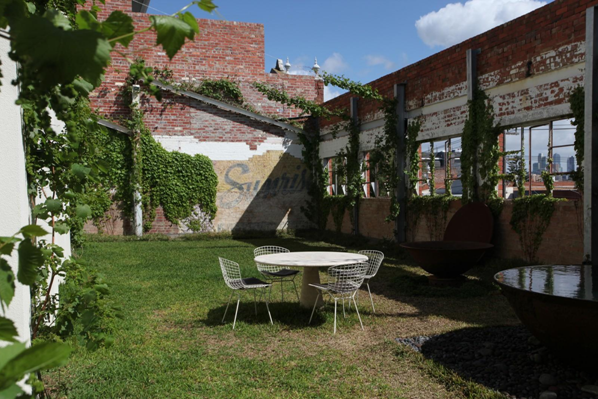 This outdoor space is Jolson’s “urban oasis”. The picture windows provide privacy and frame the view of the city beyond. The landscaping is simple but effective. The vine provides a romantic touch amplifying the character of the ruined structure and softening the rawness. The lush grass area is expansive and boasts a large water feature on one side and a steel fire on the other side that can be lit via remote control and lights up the area at night. The contemporary nature of these products has been chosen to contrast against the layering and texture of the historic brickwork. Jolson comments on the fact that most warehouses would have, at best, an outdoor terrace. This grassy open-space is a luxury and takes away that feeling of being “elevated’ from the ground. The entrance corridor is hidden behind a concealed pivot door. From here a curved steel staircase leads up to the first floor, a sculpture in its own right, it appears to unfurl like a ribbon. Constructed from raw steel it appears to float above the LED lighting. Jolson talks of the contrast between the “dilapidated façade” and the “quite refined interior”. In an attempt to interpret the building’s past life, Jolson has positioned a floor to ceiling siding wall, in the living area. The panels are adorned with a blown-up canvas photograph of the old confectionary vats that used to stand in the same spot and are said to have produced ‘hundreds and thousands’. The architect spent the time delving through archives from the previous owner. The panel conceals the kitchen area; when pulled out it reveals a stovetop and range-hood and other kitchen appliances, when it i retracted it reveals a dumb waiter and a desk. 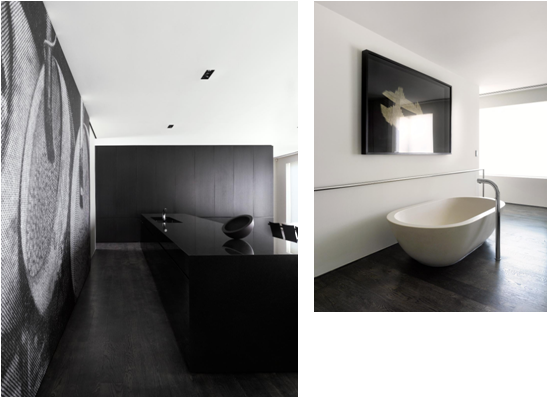 Much of the kitchen and living room is integrated with really own the sink exposed. The severity of the interiors are tempered by the use of warm tones and organic textures. The second level contains the master bedroom and en-suite, children’s bedrooms, a family bathroom, and a gym with an outdoor courtyard and shower. Jolson has created an unconventional, quirky, but fabulous office space and comfortable family home. It has all the advantages of a warehouse conversion, the charm of the old bricks, signage and exposed wooden beams, including the obvious benefits of space and location. On the inside the restoration work could be considered intrusive if it hadn’t been for the fact that the factory was in a terrible state of disrepair when Jolson purchased the property and the building could easily have been demolished.